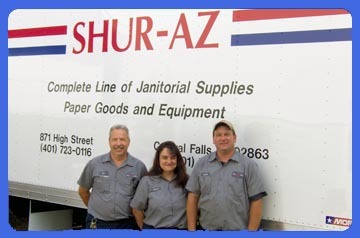 SHUR-AZ, INC. first opened its doors to the janitorial and cleaning industry in 1922, and since then, with over 85 years in the cleaning and supply industry, SHUR-AZ has developed a reputation as being one of the most knowledgeable and responsive companies in the industry. With competitive pricing, quality service, and a highly trained staff, SHUR-AZ has proven that customers do come first, and that shows by the long and lasting relationships we have maintained with our customer base. At SHUR-AZ, we do not just sell the perfect blend of cleaning supplies, we also believe in providing a perfect blend of customer service and product guarantee. There is always someone available here to answer any question you may have. With a complete line of cleaning supplies, paper products, floor care equipment, and a highly trained service department, SHUR-AZ can handle the needs of any size company, large or small. Our toll free Solution Help Line was created in response to our customers concerns and questions regarding issues related to the cleaning industry. Our customers can and do call us for answers to their most difficult cleaning questions. If we don't have the answer, we will find an industry expert who does and get the answer to our customer in a timely fashion. With the creation of our Solution Help Line, customers can feel confident that they can tackle the most difficult situations and know that they have the resources behind them.